Ravensburg, Germany, October 24, 2018 / B3C newswire / -- Vetter is a leading solution provider of prefilled drug-delivery systems and a specialist for a wide range of packaging solutions. In addition to labelling, blister packing, cartoning as well as serialization, the company offers its customers further technically sophisticated packaging solutions such as the assembly of pens, auto-injectors and safety devices. Because they facilitate self-medication for many users, the demand for these systems is continuously increasing. For example, diabetes patients benefit from the ease of handling and exact dosage during application. Vetter includes the production of these user-friendly and secure but complex packaging solutions among its core competencies. Due to its many years of experience and expert knowledge of its staff, the company is at the position to meet the different requirements that authorities, customers and patients demand in a product. “Thanks to the modular use of manual, semi-automatic and fully automatic machines, we are able to individually package anything from small clinical to large commercial quantities and, therefore, react flexibly to changing customer structures and requirements”, said Bernd Stauss, Senior Vice President Production and Engineering. 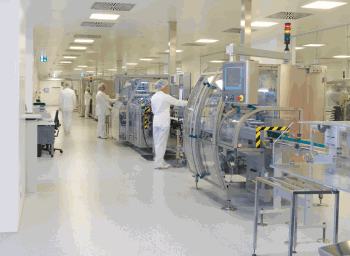 At the Ravensburg site, various syringes, cartridges and vials, some with highly complex requirements, are currently packed on state-of-the-art lines. In addition to the existing area of approximately 6000 m2, an additional 2900 m2 will be available in a new building by 2020, enabling continued flexible planning of secondary packaging well into the future. The extension also includes investments in modern testing and analysis methods. In addition to standard release and stability tests, e.g. syringes with a needle shield, the pharmaceutical service provider will be at the position to offer its customers even more extensive tests for autoinjectors beginning in March 2019. This development was achieved through the efforts of a team of specialized engineers that worked on the development of a testing machine, enabling application simulations and digital documentation on auto-injectors. Vetter is setting a new standard for testing machines for autoinjectors in the pharmaceutical industry. “State-of-the-art technologies and extensive know-how are bundled at Vetter. In this way, we create real value for our customers – high quality, compliance with regulatory requirements and user-friendly administration systems”, explained Wolfgang Weikmann, Senior Vice President Quality. This high level of quality is well received by customers. The ever-increasing demand means that Vetter will continue to expand its offering for complete solutions in the future and contribute with user-friendly solutions for patient safety, as well as convenience and compliance. Caption: Secondary packaging line at the Ravensburg Sued site with an abundance of Vetter know-how and high-tech solutions. Headquartered in Ravensburg, Germany, Vetter is a global leading contract development and manufacturing organization (CDMO) with production facilities in Germany and the United States. Currently employing 4,400 individuals worldwide, the company has long-term experience in supporting biotechnology and pharmaceutical customers both large and small. Vetter services range from early stage development support including clinical manufacturing, to commercial supply and numerous packaging solutions for vials, syringes and cartridges. As a leading solution provider, Vetter appreciates its responsibility to support the needs of its customers by developing devices that contribute to increased patient safety, convenience, and enhanced compliance. Great importance is also given to social responsibility including environmental protection and sustainability.